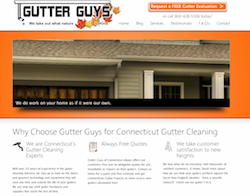 Check out our Connecticut Web Design for Gutter Guys. The company came to us to begin their web presence by searching on Google for ‘Connecticut Web Design’. Gutter Guys did not have an online presence before working with us and wanted to become highly competitive in the Connecticut gutter cleaning market. The Connecticut WordPress Design includes a fully customized WordPress theme and options. The theme has been developed to include a home page slider that showcases the company’s services and expertise. In addition, each page is equipped with contact forms to encourage potential customers to contact them for services. The website includes built in Connecticut SEO features and has been optimized for maximum search engine indexing. Any good SEO developed website needs to include a functional blog – yep this website includes a functional blog and is ready for serious internet marketing. There you have it, another beautiful Connecticut WordPress Design for one of Connecticut’s leading web design companies. If your company is in need of quality and affordable web or WordPress Design, then contact us today.